backpacker indonesia : Starting in 2010, in Port of Cirebon will be found new yachts and cruisers, which produced PT Maxim Marine Indonesia. 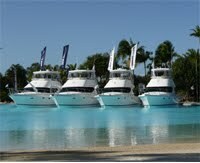 Fishing vessel and a mini cruise is manufactured to meet the demand for domestic and overseas markets. President Director of PT Maxime Marine Indonesia (MMI) Sadayuki Ito said, Wednesday (04/28/2010), the manufacturer is the first factory in Indonesia to create a mini cruise ship. The size of cruise ships are made from 38 feet to 70 feet. The whole production is located in Cirebon, even 60 percent of its raw materials from Indonesia. "Our market segment is indeed the consumers in the United States, Australia, China, Europe, and Japan. But, do not close also for domestic consumers, especially fishing vessels," said Sadayuki after launching two mini cruise ship size 65 feet. For a cruiser, the selling price reached USD 14 billion. Price was much more expensive because of the interior, engine, and installed more sophisticated designs. However, for fishing vessels 16 meters in length, valued USD 1 billion. According Sadayuki, ship engineer, to make one vessel is needed 3-4 months, depending on the number of workers and consumers desired order model. For manufacturers, yacht production capacity of 6 units per year, and for a cruiser four units per year. Produced a mini cruise ships and fishing in Cirebon is expected to enhance economic activities in Indonesia. Therefore, Sadayuki said, he will promote their products to the Government of Indonesia and the region.